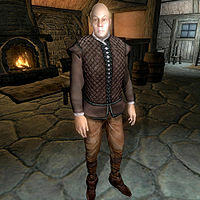 Beirir, a Nord savant, is a member of the Ulfgar clan living peacefully side by side with the Dalvilu clan in the small community of Bleaker's Way. He resides in the Ulfgar Family's House in the western part of the village and sleeps there every night between midnight and 6am. After waking up, he enjoys a two-hour breakfast in the company of fellow clan member Ulrika Ulfgar. After a bit of wandering around inside, he leaves at 10am and heads for the town's popular gathering point, the Bleaker's Way Goodwill Inn for four hours of relaxation and the occasional chat with innkeeper Kirsten. At 2pm, he heads back to the house where he spends the rest of the day until his bedtime at midnight. When you reach stage 30 of the related quest, Beirir will get out of bed at 4am in the morning and stand outside Hrol Ulfgar's house until his breakfast at 6am. The exception to this routine happens when Beirir learns that the Dalvilu clan is responsible for the murder of clan leader Hrol Ulfgar. He will then join the massed combat between the two families and fight to the death. If he survives the battle, he will return to his regular schedule. He wears a simple set of common middle-class clothing consisting of a quilted doublet with tan linens and a pair of doeskin shoes. He carries a copy of Ulrika's key to the Family House and a small amount of gold. In combat, he relies on an iron longsword.